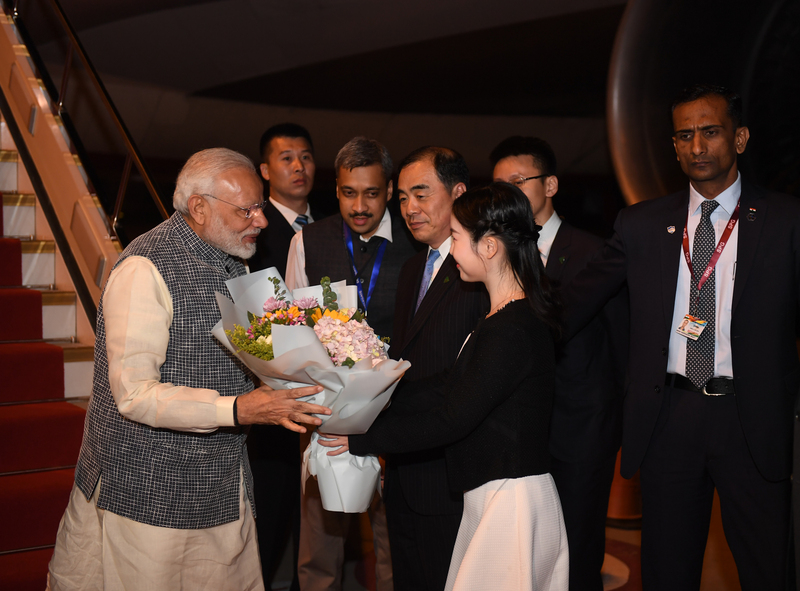 Indian Prime Minister Narendra Modi arrives at Tianhe International Airport in Wuhan, April 27, 2018. China-India relations have been on an upward trajectory since the 73-day Doklam crisis unfolded last summer. A series of positive diplomatic steps culminated in April’s Wuhan “informal summit,” in which Chinese and Indian leaders declared a stronger relationship would benefit the “development and prosperity of the region.” However, as Tanvi Madan of Brookings assesses, “deeper, stickier geopolitical and geo-economic concerns” will constrain the current “reset” and require careful management by both sides. Three examples of nominal progress illustrate the limits of Sino-Indian rapprochement. First is in regional connectivity. During the Wuhan summit, leaders reportedly agreed to pursue long-discussed joint infrastructure projects in Afghanistan. Chinese scholar Hu Shisheng argues that pilot projects in mining and other areas could help merge the two countries’ respective connectivity programs. However, any such cooperation will be bounded by Delhi’s larger reservations about China’s Belt and Road Initiative, most notably concerns about Chinese projects along the disputed India-Pakistan border and China-funded ports and associated military activity in the Indian Ocean region. Third is the situation in Doklam itself. While the Wuhan summit led to calmer tensions along the border, Chinese and Indian military deployments near the site of the standoff underscores continued animosity and distrust. Following the crisis, both China and India reportedly increased deployments of advanced fighters near the border. China has also built sentry posts, helipads, and trenches in Doklam to enable a stronger year-round military presence in the disputed area. This maneuvering by both sides could set the stage for a future crisis if and when India decides to militarily intervene (most likely if Chinese forces were to challenge India’s dominant position on the ridges overlooking the strategic Siliguri Corridor). None of these examples suggest that another Doklam-like crisis is imminent. Rather, in the words of former Indian National Security Advisor Shivshankar Menon, the Wuhan summit indicates that leaders in both countries realize the need for differences to be handled in a way that does not “lead to further trouble.” Yet merely stabilizing the relationship does not equate to enhanced trust or understanding, and both Beijing and Delhi will continue to look for ways to hedge against strategic competition—which in India’s case likely means further cooperation with the United States as part of the evolving “free and open Indo-Pacific” consortium of nations. The China-India confrontation at Doklam in the summer of 2017 marked the culmination of rising tensions between the two nations over the past two years. China’s blocking of India’s entry into the Nuclear Suppliers’ Group, a non-proliferation organization; the refusal to name the leader of a Pakistan-based group as a terrorist in the United Nations; and the Belt and Road Initiative, which includes the controversial China-Pakistan Economic Corridor, have all contributed to the deterioration in their relations. Nevertheless, both sides managed to defuse the standoff through diplomatic means, the most significant of which is the informal May 2018 Wuhan summit between Xi Jinping and Narendra Modi, which was hailed as a “reset” for their relations. However, the summit yielded few substantive measures for improving relations. Even the agreement to cooperate in joint economic projects in Afghanistan faces significant implementation challenges. While military tensions, border skirmishes, and mutual suspicions and distrust will persist, they are unlikely to erupt into a violent conflict in the near term; as Wuthnow notes, Doklam II is not imminent. This is because Chinese and Indian leaders will focus on stabilizing and routinizing their relationship with high-level visits, economic and strategic dialogues, and regular exchanges between Chinese and Indian military commanders along the disputed border, and by desecuritizing their water dispute. With China keen to reassure the world of its peaceful intentions, it is unlikely to soon engage in outright belligerence. The potential for conflict in the longer term nevertheless remains, as it would in any asymmetrical dyad. China and India are rising powers and competitors for influence, but there is also substantial economic and military asymmetry between them. India suffers from a large trade deficit with China, and China’s GDP is nearly five times that of India’s. China’s defense spending is higher than India’s, and it is investing in power projection capabilities, in contrast to India which has neglected its investments in its military. Misperception is a common occurrence in asymmetrical relations, increasing the likelihood of conflict. India, as the weaker party, views Chinese actions as much more threatening than they are. For instance, when China blocked a tributary of the Brahmaputra in 2016 to build the Lalho Dam, Indian pundits believed that it was a retaliatory measure against India for suspending water talks with Pakistan after the 2016 Uri attack in Kashmir. A consequence of the Doklam standoff is that China’s and India’s threat perceptions of each other have increased. Each side is reconsidering strategies for dealing with the other. This will likely intensify the strategic rivalry between them in the longer term. The Doklam standoff was the longest border confrontation between China and India in nearly three decades. Even though no blood was shed, the world held its breath, concerned that tensions between these nuclear-armed neighbors might dangerously escalate. In restrospect, the way the two countries managed the confrontation and brought it to a close looks impressive. But the end of the standoff did not immediately result in softening relations. On the contrary, each country left with greater distrust toward the other. This is because Doklam wasn’t a singular point of contention but the latest in a string of developments that have strained Sino-Indian ties in recent years. Strikingly, things look far different today. At the informal summit in Wuhan in April, Xi and Modi made nice. Though no real agreements were reached, both sides heralded the meeting as a positive development that would allow the two countries to begin afresh on a more productive path. Last week, when Modi was again in China, the two leaders emphasized the “positive momentum” for bilateral ties. In a sign of growing comity, Xi accepted Modi’s invitation to visit India for a second informal summit next year. After the low point of Doklam, how did India and China reach this surprising détente? First, both leaders may have realized that Doklam went too far and wanted to prevent another major dustup. For both of them, domestic economic development remains the top priority. With Indian elections around the corner in 2019, Modi is engrossed with delivering on his economic agenda. Another border conflict before then would be a distraction that detracts from his economic agenda. This likely was part of India’s calculus in seeking accommodation at Wuhan. Second, global dynamics have shifted significantly in the past year. China finds itself in the midst of a burgeoning trade conflict with the U.S. A trade war would harm both sides and the global economy, and the unpredictability of the U.S. administration means further deterioration in ties is not out of the question. Beijing, therefore, has a strong incentive to stabilize its relations with other countries in the region so that it doesn’t end up facing multiple crises simultaneously. It is also worth considering whether the U.S. is forcing second thoughts in India. Under Modi, India has moved closer to the U.S. than ever before and has increasingly positioned itself as a critical partner of the U.S. in East and Southeast Asia. The Trump Administration’s policies and actions, however, which have unsettled its allies, are likely also raising eyebrows in India. Modi may be less keen to antagonize China if he is starting to perceive the United States as an unreliable or ineffective partner, at least in the short term. Does the recent thaw in relations guarantee no border clashes in the immediate future? That is hard to say with confidence given Sino-Indian history, but it will depend as much on their bilateral relations as it will on what else is happening in the Asia-Pacific. While Sino-Indian friction will continue, relations have improved from last year’s low, and a border standoff seems unlikely for three reasons: learning, national self-interest, and drifting U.S.-India relations. First, it is plausible both sides have learned, offering a modicum of stability. During the standoff, China seemed to escalate threats while underestimating Indian resolve and geographic advantages, demonstrating what Yun Sun has described as “strategic contempt” and hubris towards India. Since Doklam, anecdotal evidence suggests Beijing has sought to correct this bias by allotting greater resources to the analysis of South Asia. China may better appreciate Indian sensitivities, local capabilities, and the Modi government’s resolve, reducing risks of miscalculation. Doklam likely reminded Delhi of its periphery’s vulnerabilities. Despite initial triumphalism, Indian strategic discourse has grasped that victory at Doklam was tactical, provoked greater Chinese fortifications, and failed to restore the status quo. The standoff exposed Delhi’s lack of even 10 days of ammunition reserves and a functioning sea-based deterrent. After staring into the abyss, both sides may have decided to reevaluate each other’s positions, avoid provocations, and navigate frictions with caution rather than false optimism. National self-interest in economics and geopolitics can also bolster stable relations. For an underperforming Indian economy facing “jobless growth,” China offers perhaps the largest source of new foreign direct investment (FDI) to India, totaling $8 billion last year. Recently, China has appeared willing to drop barriers to reduce the trade deficit with India. Chinese FDI combined with capacity transfer can also stimulate Indian manufacturing. Another border standoff might foreclose on such opportunities as it did during Doklam, when Chinese investment was delayed or deterred. India entering an election year further incentivizes avoiding conflict that could be economically damaging. Engagement with China instead of strident opposition could also dampen geopolitical competition in India’s own backyard, which may afford Delhi consultations or geopolitical bargaining. One senior official privately remarked that India could have leveraged approval of China’s Belt and Road Initiative for Chinese backing of Indian overland access to Afghanistan. Similarly, China could benefit strategically from leveraging concessions in India’s neighborhood to subvert Indian integration into U.S.-led alliance systems in Asia. Since Beijing was concerned by Delhi’s seeming gravitation towards a U.S.-led military alliance, the perceived deceleration of the U.S.-India strategic relationship reduces tensions that fueled Doklam. Though rhetorically strong, the relationship’s substance—including arms sales, technology transfers, interoperability, investment, and joint operations—has been erratic and slow-moving, leading to talk of “India fatigue” in the Pentagon. Drift stems from several sources. Structurally, India’s Cold War distrust, risk-averse bureaucracy, and governments engrossed with endless election cycles constrain transformational foreign policy. U.S. preoccupation with Afghanistan also constrains nimble innovation in its Indo-Pacific strategy. Moreover, the current administration has injected new uncertainties, particularly over the credibility of U.S. commitments, encouraging Indian hedging and buck-passing. Though perhaps distressing from an American standpoint, U.S.-India drift, along with lessons learned and a hard reappraisal of national self-interest, may ensure stable China-India relations prevail. Since the mid-2000s, the overarching trend in China-India relations has been one of growing competition with a narrowing set of issues where the two are pursuing meaningful cooperation. Within the confines of this trajectory, there is a band within which bilateral ties blow hot and cold in business cycle-like rhythm. The relationship hit one of these troughs in 2016 when Beijing’s efforts to deny Indian membership at the Nuclear Suppliers Group and block sanctions on Pakistan-based terrorists at the United Nations generated unexpected blowback in Delhi. Ties may have reached a contemporary nadir the following summer during the unprecedented standoff in Doklam. However, the border crisis also served to underscore the need for a tactical reset and set in motion efforts to stabilize relations that resulted in the informal summit between Modi and Xi in Wuhan this May. The summit was billed, and in my opinion mischaracterized, by some analysts as demonstrating a more far-reaching re-alignment toward China amid uncertainty about the Trump administration. In reality, it represented a more modest reversion to the mean: political stability against the backdrop of a growing geopolitical competition, particularly in South Asia and the Indian Ocean. In contrast with the praise he offered for the U.S., Japan, Korea, Australia, ASEAN, and others, Modi struggled to put a positive spin on bilateral ties with China. “No other relationship of India has as many layers as our relations with China,” was the most charitable characterization he could muster. It reminded me of former Foreign Secretary Nirupama Rao’s description of China-India ties as, “complex, but growing variegated in texture and substance.” Yes, Modi also recognized the two countries have “displayed maturity and wisdom in managing issues and ensuring a peaceful border.” He curtly observed: “Trade is growing.” While that’s true, bilateral trade, once an area of strength, has become a growing point of contention as India’s trade deficit with China has ballooned in recent years. In mid-June, we learned India’s deficit with China grew a stunning 23% in 2017-2018, setting a new record at $63 billion out of roughly $90 billion in total trade. Sino-Indian relations have stabilized since the serious military confrontation last year at Doklam. The “informal” Wuhan summit between President Xi and Prime Minister Modi was touted as the “reset” in the bilateral relations. The two leaders have met again at the Shanghai Cooperation Organization Summit, and there are more meetings planned. The talks are believed to have improved understanding between the two sides even as substantive issues between India and China remain. Though there is optimism, there appears to have been no significant progress made on issues that are crucial to both sides. Beijing has yet to accept India’s concerns on the Belt and Road Initiative (BRI), especially the China-Pakistan Economic Corridor (CPEC) branch of the BRI, or support India’s bid to join the Nuclear Suppliers Group (NSG) or India’s efforts to use multilateral tools to contain Pakistan’s support for terrorism. India remains concerned also about China’s greater role and presence in the maritime space in India’s neighborhood, and China has not taken steps to reassure India that its intentions are benign. While these are important parameters for both India and China to judge the state of the relations, a more critical and a deep-rooted problem is the competition for the Asian strategic space. Beijing believes its rise is a natural phenomenon and it approaches the world in a hierarchical manner, which is increasingly problematic for a number of countries in the Indo-Pacific, including India. The speech delivered by China’s Vice Foreign Minister Liu Zhenmin at the sixth Xiangshan Forum, held in October 2015, reveals China’s view: he spoke about the responsibility of “big countries” in not creating spheres of influence while small and medium countries should not take sides between big countries. The Chinese division of the international system into big, medium, and small countries itself reflects China’s hierarchical view of the international system and the differentiated role that it has assigned to itself as a big country and to its neighbors as small countries that ought to know their place. This line of thinking repeated itself when President Xi discussed with President Obama the format for developing a new pattern of major country relations. Such an approach is hardly the way to reassure its neighbors or win friends. The Asian strategic order that China seems to want is one where it sees itself as the hegemon. Therefore, even as relations have become warmer, it is unlikely that Sino-Indian relations have stabilized for good. Border stand-offs like Doklam are just the beginning of a troubling phase in Asian security. China and India have both made efforts to improve the bilateral relationship after Doklam, most recently with Chinese President Xi Jinping and Indian Prime Minister Narendra Modi conducting an informal summit in Wuhan at the end of April. But the structural and perceptual issues that led to the Doklam standoff still dominate the Sino-Indian relationship. Therefore, the likelihood of another border incident remains high. First, China’s main strategic direction includes prioritizing and strengthening its position in a number of territorial disputes. Sovereignty and territorial integrity have always been core interests of the Chinese Communist Party, and now China has the capabilities, power, and influence to ensure continued progress on these issues. Xi has staked his personal legitimacy on this, making consistent statements along the lines of those made in front of the National People’s Congress in March 2018 when he asserted that China would not cede “a single inch” of its territory to others. In sum, while China is working to deepen diplomatic ties with India and expand the economic relationship (bilateral trade reached a historic high in 2017), these positive trends will not affect China’s determination to gain an upper hand in the border dispute. Second, China’s coercive tactics, which include establishing a greater physical presence, employing coercive diplomacy, leveraging legal rhetoric, and using its media to control the narrative and issue threats, have also not changed. Salami-slicing by definition means taking small steps, and pausing when things get heated to wait for a better opportunity to move forward. China may be laying low along the Sino-Indian border for now, but China’s position on the border dispute has not changed; China will continue to build infrastructure and roads on its side of the border to enhance its presence (and therefore claims) as well as improve the Chinese military’s ability to mobilize quickly and sustain operations along the border if necessary. Third, India will continue to find it necessary to push back against Chinese incursions, coercion, and risk-manipulation along the border. Like Beijing, New Delhi is extremely sensitive to the issue of territorial integrity, and has consistently opposed Chinese incursions into disputed areas. This consistent strategic position has recently been reinforced by domestic political salience—in large part thanks to the Doklam stand-off. The Indian strategic elite and popular opinion increasingly perceives China as bearing hostile intent towards India. Thus, this action-reaction cycle of China pushing the boundaries literally and figuratively, and the Indian imperative to respond to establish deterrence, is bound to lead to another standoff. The only question is when the next time will be that China pushes too far and triggers an Indian military response. The Doklam border stand-off of summer 2017 was an India-China relations “valley.” The April 2018 informal Wuhan Summit between Prime Minister Narendra Modi and President Xi Jinping represents a “peak.” Each transpired without fundamental change in an India-China strategic relationship that features deep, intractable geostrategic and geopolitical differences astride mutually-beneficial geo-economic engagement. Like his recent predecessors, Modi needs trade with China. China is India’s number one trading partner. Despite a troublesome trade deficit with China that reached U.S.$50 billion in 2017, India conducted a record U.S.$84 billion dollars in bilateral trade with China last year, including U.S.$16 billion in exports—a 40 percent increase. Without Chinese trade, India cannot grow GDP at the 7-8 percent per year it must achieve to meet national strategic goals. At Doklam, Modi’s dogged approach demonstrated that India views China as an enduring rival and he can be tough with China in the main arena of bilateral tensions: territorial disputes. The Doklam standoff came on the heels of years of selected Indian proclamations of dislike about Chinese behavior in the South China Sea. Since Doklam—as before—India continues to stand against China’s Belt and Road Initiative on economic, political, and cultural grounds. Modi’s speech at the Davos Economic Forum in January 2018 left little doubt that India will not be a partner with China’s present and future proposals to extend its vision of trade and financial rules around the globe. India also remains deeply troubled by China’s strategic partnership with Pakistan and its growing financial and military presence in the Indian Ocean Region. But as 2018 moves toward 2019, two imperatives—one domestic and one international—mandate a tactical moderation in India’s confrontational stance toward Beijing that had been growing since 2014 and that peaked at Doklam in 2017. First, a national election looms large for India in early 2019. Modi now needs a stable border with his neighbor to the north. After a relatively slow 2017, Modi must demonstrate unmistakable economic growth over the coming year. Both aims require Xi’s help. Then, there is President Donald Trump. Modi and his team have taken Trump’s measure and have no illusions. 2017 confirmed that Trump’s economic nationalism will not leave much space for greater trade or investment benefiting India. In 2018, Trump has shown he will undertake political and economic confrontation at the same time, and he will goad American partners to sanction political adversaries even as Washington levels economic sanctions on the very same partners. Trump also will demand things that the United States cannot compel. In this kind of an environment, Modi cannot afford overt friction with Beijing. Domestic and geopolitical factors make this a prudent moment for Modi to reset the tone of India’s China relationship. This doesn’t mean a strategic change in the relationship, but it does mean that India’s approach toward China will seek tactical accommodation and rhetorical calm for the foreseeable future. It’s back to business in India-China relations. The 72-day-long Doklam face-off in the summer of 2017 had capped a period marked by a visible slackening of the momentum in India-China ties, and the relationship frequently ran into choppy waters over the past few years. The public discourse was invariably about the “strategic distrust” in the relationship. When Prime Minister Modi and President Xi met “informally” in Wuhan, it was an acknowledgement of the fact that “[N]o other relationship of India has as many layers as our relations with China,” as Modi put it in his June speech at the Shangri-La Dialogue. Wuhan was certainly about preventing Dokalam-like situations—this does not guarantee that further “incursions” will not occur, but it was a strong political signal that the world’s two most populous countries intended to harmonize their rhythms. This is already visible in the acceleration of visits, dialogue, and exchanges in the past few months at all levels. Three aspects have coalesced quite distinctly and are increasingly likely to dictate policy-making in both Delhi and Beijing: One, with the geopolitical issues grabbing the headlines, it is mostly overlooked that economic engagements have become the most dynamic and transformative aspects of the India-China relationship. China is India’s largest trading partner and one of the fastest growing sources of FDI into India, jumping from 35th position in 2011 to 17th in 2016. Two, China is demonstrating the asymmetry in their comprehensive power capabilities, most obviously in India’s neighborhood. But, better relations between India and China can reduce the possibility of China being pulled as a countervailing force in regional issues—even in the context of Pakistan. All of India’s neighbors have enthusiastically signed up to China’s Belt and Road Initiative (BRI)—a potentially problematic scenario. But China too realizes that without India the BRI will have a big hole. Both appear to be cautiously testing how to bridge this divide by kick-starting a joint venture in Afghanistan. The challenges faced by the South Asian region (poverty eradication, environmental degradation, and terrorism) are all interrelated and require cooperative solutions. Even the question of river water sharing or the problems of the lower riparian countries will require coordinated action. China will have to be part of the solution, given that South Asia is emerging as a major destination of its FDI. Third, both India and China are factoring in the economic, political, and strategic uncertainties unleashed by Trump. While cooperation with the U.S. continues to be a crucial component of Indian foreign policy, coordination with China on the regional multilateral and global platforms is inescapable. Working in tandem with China, India can be in a better position to ensure that it plays its due role, both in the agenda-setting and shaping of the new regional multilateral and global institutions. Both India and China need each other; the India-China reset is a prerequisite for the Asia reset.